Computers, IT Subjects, SciFi, Vehicles and Other Fun Topics. Zo looks at the Fox News GOP debate performances of Donald Trump, Dr. Ben Carson and Gov. John Kasich and Gov. Mike Huckabee. He is critical of most, but find out which candidate he tips his hat to. 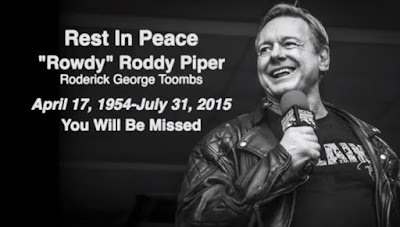 Rowdy Roddy Piper's Last Piper's Pit - July 28, 2015. Roddy Piper's last Piper's pit, courtesy of MCW, a classy local Pro Wrestling promotion in Baltimore. I have an ability to take difficult technical subject matter and break it down into layman's terms. I am a Computer Systems Administrator serving as a Team Leader, working to support manufacturing systems. I have been called an expert when it comes to Customer Service, as well as technology subjects by my managers, customers and coworkers. That sure is nice of them to say! I support Windows based computers and infrastructure. I have also served as a Graphics Designer working on commercial multimedia production software and graphics tools, such as Photoshop, Final Cut, and Corel Draw. I enjoy the configuration of, and subjects pertaining to Mac and PC systems.